To make dessert time easy and on track I like to make my desserts ahead of time and freeze them for the week. It makes me less likely to omnom the whole tray justifying to myself that they might go bad if I don’t. Really, who hasn’t used this excuse one time or another? After the holidays I had some leftover marshmallows, can’t let those go to waste. What does one do with marshmallows? 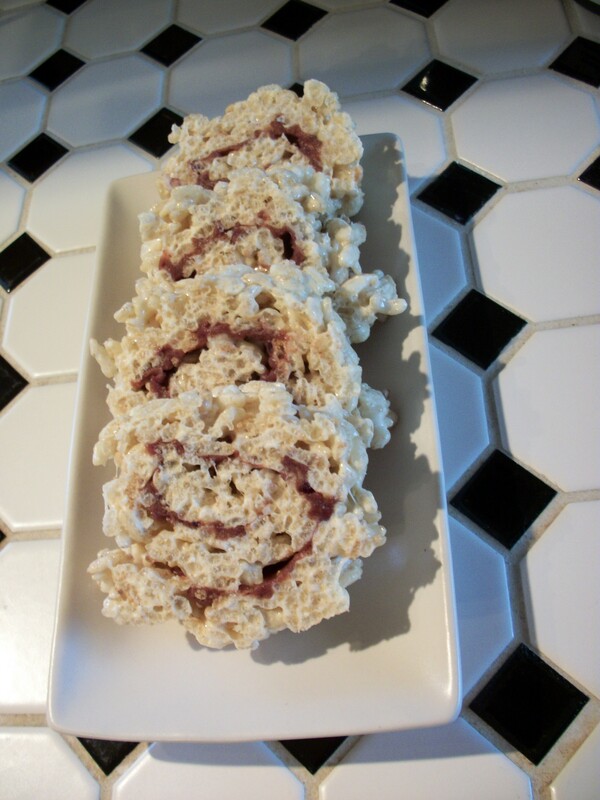 Make rice cereal treats of course! We can’t make the same old treats around here though. After spending a bit of time fantasizing about a sushi dinner I was looking forward to I realized just what had to happen. Numminess followed. Melt margarine/butter using either a microwave (10 second bursts) or in a pot on an element. Add marshmallows, stir and melt in micro (10 second bursts) or on the element. 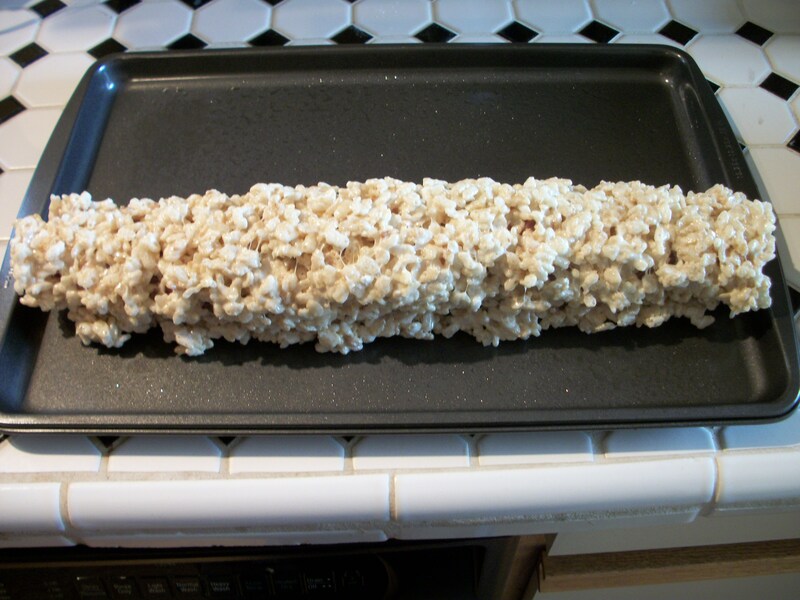 Remove from heat and add brown rice cereal. 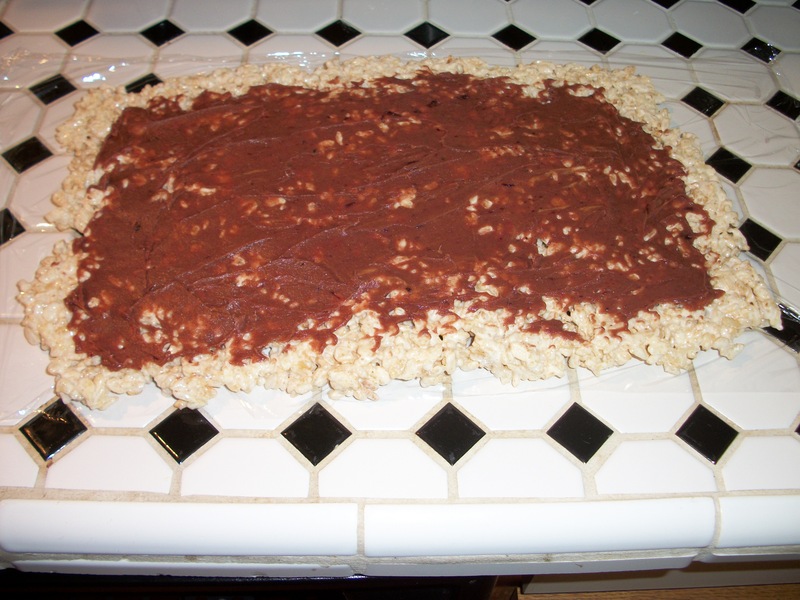 Add the treat mixture to a greased baking sheet. Press down and into edges to create a flat rectangle. Allow to cool for 20-30 minutes. It should still be pliable if you list the edges but not too tacky to the touch. Combine peanut butter, jam and honey in a bowl. Turn out the cool rice mixture onto a plastic mat or plastic wrap. Spread the peanut butter mixture onto the rice treat. Roll, using the plastic to help you keep it all together, like a sushi roll. Put the roll into the freezer for about 20 minutes. Slice and enjoy! Makes 16 “dessert sushi” each one contains 155 calories, 4 grams fat, 25 grams carbs, 1 gram fibre, 2 grams protein. You can keep these in the freezer and take them out to eat immediately. A fun twist on a classic that you can customize with any filling you feel like. My husband suggests the chocolate and almond butter. This entry was posted in Comfort Foods, Craving Buster, Dessert, Snack and tagged cereal, Jam, marshmallow, peanut butter. Bookmark the permalink. Thanks! It was, we had the last of it the other day, I think I need to get more brown rice cereal!